Here is a snippet of 21st Century Learning, featuring the work of Ashley Kannan, Digital Leader at Julian. BagTheWeb is one of many free online social bookmarking tools that allows users to easily create a collection of web links which are conveniently stored and shared online. This cool tool functions similarly to Delicious, utilizing an optional bookmarklet to make collecting web links a breeze, but the organization of the links in an online bag is a unique feature that makes this tool quite appealing. A bag of web links can collect any topic, and it can also be link to other relevant bags so there is no need to duplicate work when resources overlap. 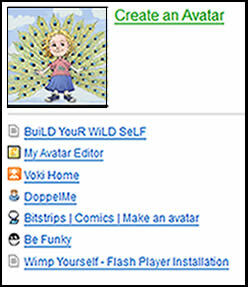 The website is very user-friendly and informative, and it includes a tutorial to help users create a bag of their own. http://bagtheweb.com/embed_bag/UhnBRi Go to BagTheWeb: Follow the numbers steps at the top of the page to get started.